Have you ever wondered why the Oakland Unified School District (OUSD) regularly breaks the law by violating the state education code mandate that at least 55% of educational expenses go to classroom instruction, when virtually every other district in the state meets this stipulation year in and year out? Have you ever wondered where the money goes, if not to the classroom? Well, I just looked over the salaries of new superintendent Antwan Wilson and his top administrators, and it sure says a lot about where some of that money is poured. And about the priorities of a school board and administration that pretends to turn its pockets inside out and cry, “We’re cash-strapped!” to explain why they pay teachers at the bottom of the county and near the bottom of the state. What are those priorities? Grossly overpay top administrators? CHECK. Create high-paying positions for your friends and bring them in from over a thousand miles away. CHECK. Pad the payroll with redundant positions by hiring several,people to do the same job, and then paying them all exorbitant salaries. CHECK. Give nearly all administrators pay hikes from last year’s salaries far greater than the total raise for teachers over the past 12 years. CHECK. Continue to outsource at double the state average, and make sure some of your old buddies from Denver get a cut of the action. CHECK. —Antwan Wilson, Superintendent of Schools: salary $280,000 / year ($30,000 / year more than Gary Yee was paid last year as acting superintendent). —Allan Smith, Chief of Schools: Salary $175,000 / year — brought in by Antwan Wilson from Denver Public Schools. “Chief of Schools” is a brand new title created by Wilson for Allan Smith. —Yana Smith (spouse of Allan Smith), Chief of Organizational Effectiveness and Culture: Salary $155,000 / year — brought in by Antwan Wilson from Denver Public Schools. “Chief of Organizational Effectiveness and Culture” is a brand new title created by Wilson for Yana Smith. We don’t need both a Superintendent of Schools (Antwan Wilson, $280,000 / year) *and* a Chief of Schools (Allan Smith, $175,000 / year). And we have absolutely no need to pay $155,000 / year to a “Chief of Organizational Effectiveness and Culture” (Yana Smith, spouse of “Chief of Schools” Smith). But wait, there’s more. Vernon Hal’s title used to be “Chief Financial Officer.” Now he’s the Deputy Superintendent for Business. We don’t need both a deputy superintendent for business (Vernon Hal, $193,000 / year) and a Chief Financial Officer (Ruth Alahydoian , $150,000 / year). Then there’s Brigitte Marshall. Four years ago, she was in charge of the Adult Ed program, and presided over its destruction, shutting down 95% of that formerly vital program. Based on this atrocity, since then her career has taken off and she has received promotion after promotion and raise after raise. Now her title is “Chief Talent Officer” (I am not making this up!) and her base salary is $160,000 / year. —Bernard McCune, for whom he created the post of “Deputy Chief, Post Secondary Readiness”, with base salary of $157,500 / year. —Devin Dillon, the new Chief Academic Officer, raking in $175,000 / year. Superintendent Wilson also displayed his priorities by filling the vacant OUSD Chief of Police position — hello Jeffrey Godown, goodbye $150,000 / year plus benefits. So if Wilson is cutting the central administration budget, much of the cuts are likely coming from the lower paid administrative support. This would be a repetition of what Randy Ward did in 2003 – 6 when the state came in. He brought in all kinds of Broad Foundation graduates and residents at the high end (Troy Christmas; Jonathan Klein; and many others) and promoted some ambitious locals, while laying waste to central services — eliminating central copy services, almost annihilating maintenance (electricians, painters, window repair, etc.) and thus forcing schools to buy services from the likes of Kinko’s. Randy Ward made other cuts “away from the classroom” — of clerical, cafeteria, custodial, and other essential school classified staff positions. 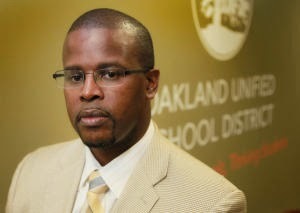 Today, despite all of Antwan Wilson’s rhetoric, we hear reports that although Oakland High projects increased enrollment for next year, it is scheduled to lose several FTEs. So when Antwan Wilson says that he’s “budgeting for the classroom”, please excuse us for thinking, “Shades of the state takeover. More, needless, high-level and high-salaried administrators; salary boosts at the high end; chopping classified staff and low-level administrative support jobs.” Unacceptable. (1) Eliminate high-end bloat. Start by cutting redundant dead wood. No need for a Chief of Schools — there’s already a Superintendent of Schools. No need for a Chief Financial Officer — there’s already a Deputy Superintendent for Business. No need for a “Chief Talent Officer” (I trust no explanation is needed) nor a “Chief of Organizational Effectiveness”. Eliminating those four positions alone would save over $800,000 in combined salary and benefits. And that’s just a start. Other cabinet posts could be eliminated. (2) Give up that $280,000 / year base salary. Instead, cap all district salaries at teacher maximum salary (currently $84,000 / year if annualized to a 12-month basis). We hear from the board, and from folks like Wilson, about how important teachers are. But when it comes to compensation, the well’s dry — virtually no raises since 2002. Why should administrators be paid more than teachers and staff? Why should we tolerate this gross and widening inequality? Reducing the salaries of Wilson and his cabinet to teacher max, combined with cutting redundant cabinet positions, would save close to $3 million / year in salaries and benefits. And beyond the cabinet, there are 200 – 300 additional administrative positions salaried above teacher max — many of them $50,000 / year or more higher in base salary alone. My rough estimate is that capping all salaries at teacher maximum would save in the neighborhood of $12 million / year. (3) Systematically review and reduce outsourcing to private consultants. We’ve noticed that Antwan Wilson is not shy about bringing in folks who worked for him in Denver and either creating high paying district jobs for them, or giving them lucrative contracts. Nothing new here. For years, OUSD has been even more generous to private contractors than it has been to its high-paid administrators — and that’s generous indeed. In fact, five years ago OEA and CTA presented data to the Public Employee Relations Board’s Factfinding Panel showing conclusively that proportional to its size, OUSD had twice the administrative overhead and twice the outsourced contracting of the average California school district. OUSD ought to be able to cut back in this area by as much as $20 million / year or more — and where feasible redirect the work to unionized district employees. So adding it up, we’re talking $30 million / year or more. And that ain’t chump change. Heck, with that, even the inept and malevolent OUSD administration could probably abide by state law and devote at least 55% of educational expenses to classroom instruction, providing (at last!) adequate raises to all schoolworkers, while at the same time preserving and even cutting class size (by hiring more certificated staff) and increasing support (by hiring more classified staff).